American Beauty Car Show 06.07-08.07.2012, Hāpsala, Igaunija - AUTO FORUMS | viss par auto! No 6. līdz 8. jūlijam Hāpsalā ir iespējams piedzīvot Baltijas lielāko ASV automašīnu pasākumu „American Beauty Car Show" , kura laikā notiek mašīnu izstāde, salidojums un ātrumsacīkstes. 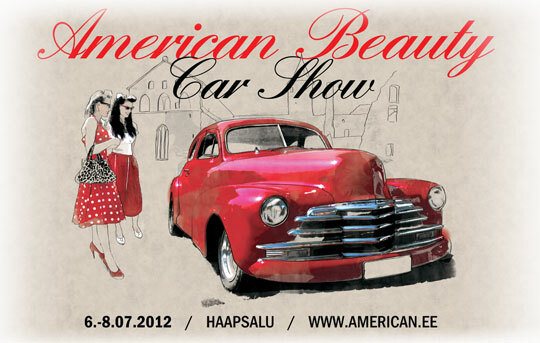 American Beauty Car Show is the biggest american car exhibition in Baltics, which consists of car show, reunion and drag race. For eleven years all american vehicle owners and major car fans have gathered to Haapsalu for one summer weekend. And so it will carry on this year and for the twelfth time allready american vehicle owners can start up their corgeous cars and drive to beautiful and silent Haapsalu to have a wonderful time together. 2-day tickets will be exchanged for wrist belt. The camping area will be opened on 6th of July from 12.00 p.m.
Only american car owners may camp around the Castle yard a.k.a Krahviaed. * It is forbidden to build a fire (barbecueing is allowed). * Do not throw the garbage on the ground. * It is forbidden to harm the roads and grass fields. yard, exit to the Vaba street. camping. It is forbidden to be in the camping area without a show ticket. * Cars, motorcycles, minivans and caravans may enter the camping area. Other car owners included people without the show ticket may camp in other areas - the area around Vee street and Aafrika beach.